VICTORY! On June 13, 2013, the Supreme Court ruled in our favor to strike down Myriad Genetics’ patents on the human “breast cancer” genes, BRCA1 and BRCA2—and not just Myriad’s patents, but patents on all human genes. This is a tremendous win for women’s health – and for all our health! On April 15, 2013 the Supreme Court heard our landmark legal challenge to Myriad Genetics’ patents on the BRCA genes. We rallied at the Supreme Court during oral arguments to take a stand against human gene patents. In 2009 we took action against gene patenting by joining other women’s health groups, individual women, researchers, genetic counselors, and scientific organizations representing more than 150,000 geneticists, pathologists, and laboratory as a plaintiff in a lawsuit. The lawsuit, filed by the American Civil Liberties Union and the Public Patent Foundation, challenged the legality of the U.S. Patent and Trademark Office’s practice of granting patents on human genes. Specifically, this suit challenges the validity of the patents that grant Myriad Genetics control over the BRCA1 and BRCA2 (the “breast cancer”) genes. • Blocking the development and availability of alternative tests. • Lack of data sharing and analysis. • Limited information for underserved populations. Breast Cancer Action is the only national breast cancer organization to join the lawsuit against Myriad Genetics’s patents because we don’t take money from companies that profit from or contribute to cancer. For a complete timeline of our legal challenge to Myriad’s patents on our genes, click here. 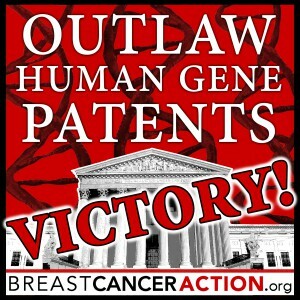 Read about our rally to outlaw human gene patents on the Supreme Court steps. Click here to download a one-page flyer explaining the issue. HuffPost Live Interview: Should Anyone Be Allowed to Patent Your Genes?